Fizzics Waytap: Fresh From the Tap Taste at Home | Nerd Much? Science is cool, and there’s nothing better than a great-tasting beer, so when the two come together to make beer better, it always piques our interest. You may remember Fizzics, the company that last year introduced the first generation Fizzics Beer System, which provided the perfect pour from bottled beer to provide fresh, draft taste from any store-bought beer. Now, the company has returned with their next innovation, the Fizzics Waytap, a unique kitchen gadget for beer-lovers. 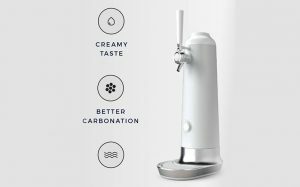 The Fizzics Waytap uses sound waves to convert a beer’s carbonation into densely compacted Micro-Foam that unlocks the fresh-from-the-tap taste — meaning every beer gets the perfect head. Simply slip your beer into the Waytap, pull the handle forward to pour your beer under pressure and at a controlled rate. Then, push the handle backwards and it will utilize sound waves to create tiny Micro-Foam that will sit on top of your beer, sealing the body and locking in its carbonation so that the flavor doesn’t escape. It’ll give virtually any better a creamier mouthfeel and taste. With the original Fizzics system being such a great innovation for beer-drinkers, we are incredibly excited to get our hands on their newest product. The project has already been funded on Kickstarter, bringing in over $712K, hitting its original $50,000 goal with ease. With 21 days to go, you can still get in early and back it as well. And, stay tuned to Nerdmuch.com for our Waytap review when they ship.